Nicknames: Traverz (by Morrigan), Travvie (by Milly). Friendly, even-tempered, and described by most as a “pretty chill guy”. Travis interacts well with others and gets along with just about anyone (save a few, ahem, nasty in-laws). His downside is that he can sometimes be judgmental of others and outright cold toward anyone he doesn’t like. He also fails to notice the obvious, such as girls who are interested in him, or an enemy in disguise. He has led a fairly sheltered and exceptionally good childhood, which makes it difficult for him to understand the less unfortunate. Travis is the son of proud parents Gandra Dee and Fenton Crackshell (a.k.a., Gizmoduck). 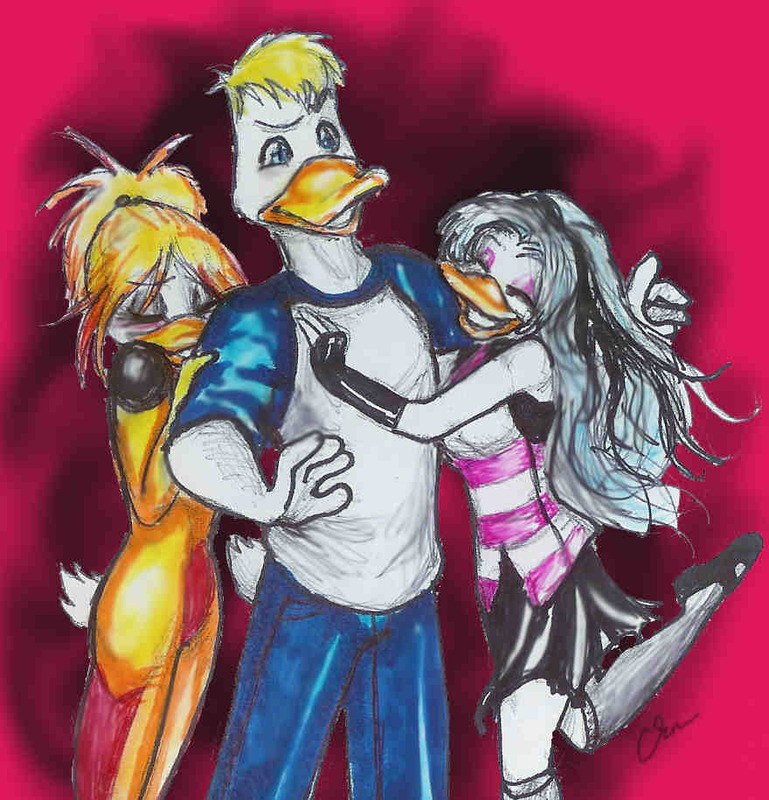 He grew up alongside Darkwing and Morgana’s daughter Mildred, and befriended Morrigan (daughter of Negaduck and Mal) who attends the same high school as him. Both girls bickered constantly for his affection despite Travis’ total obliviousness. Travis is the star Quarterback at St. Canard High and every teenage girl’s wedding fantasy. Despite the social fame he somehow manages to remain modest and kind-hearted. He enjoys English literature, especially poetry, and spends his spare time assisting his father Gizmoduck with crimefighting. An updated Gizmosuit, entitled ‘Mark IV’ was given to Travis which is activated by a medallion he wears at any given time. Unlike the original Gizmosuit, Mark IV allows him to summon up individual pieces of armor with telepathy. Although the suit was not originally intended for him it only responded to his body and so Travis unwittingly became a part-time superhero. In later years he confesses his love to Morrigan and the two begin dating, which causes severe conflict between Morrigan and her parents, due to the fact she’s a villain and he’s a crimefighter. However Travis was never truly passionate about being a superhero and eventually abandons crimefighting for a full-time Football career. He and Morrigan eventually marry but her parents never truly accept him into the family.